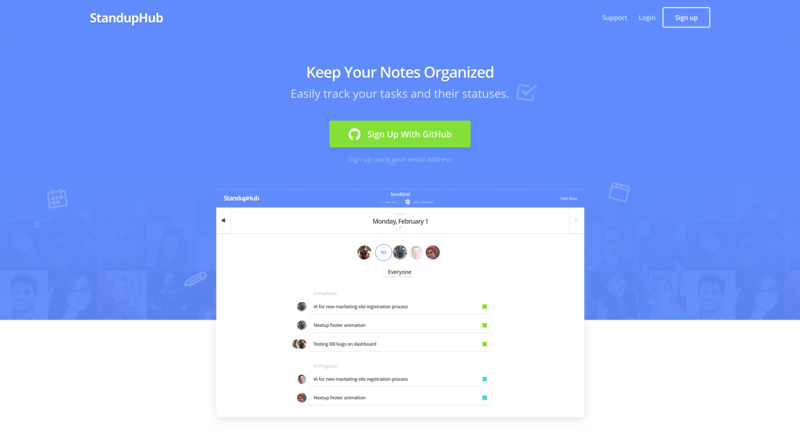 Announcing StandupHub Beta: Making Tomorrow's Standup Meeting a Whole Lot Easier. Announcing StandupHub Beta: Making Tomorrow's Standup Meeting a Whole Lot Easier..
Remembering what you did yesterday, for today’s standup meeting just got a whole lot easier. StandupHub Beta allows you to store and share daily updates, blockers, and goals in one place, while preventing you from falling prey to “standup amnesia”. What challenges and blockers do you have? These short-format meetings are an essential team communication strategy for keeping a project on track and helps to give your client more context for how a project is advancing — but sometimes standup amnesia can strike at the most inopportune moment. It’s easy to sign up with your GitHub account or email address. Next, create a New Project and invite your colleagues to join. As you add standup items to your project, tag them as In-Progress, Blocked, or Completed. Tomorrow morning just fire up StandupHub, sort you or your team members' tasks by Type, Time Entered, or Time Updated, and you’re ready to roll. No more frantic searches through the GitHub repo two minutes before your meeting and no more awkward silences. StandupHub enables you to effectively and efficiently present the value of your work to your client and your team. And shorter, more efficient meetings that keep everyone up to date mean you can get back to focusing on what matters. Start using StandupHub Beta today and use the support widget to leave us questions, comments, and suggestions! P.S. StandupHub is a side-project collaboration built by MojoTech employees. MojoTech supports and encourages employees to engage in innovative side-projects and dedicates approximately 15% of salaried time to work on those projects in addition to providing marketing and commercialization support to help them gain traction. We do this because we believe that side-projects encourage creativity and experimentation which can improve employee innovation in ways that spill over into the company’s core services and product offerings. Plus, they are just fun.